We’ve been on Koh Phangan for two days and are now online once more. After we spent the first two nights in a really cheap place up north in Chaloklum, following the Lonely Planet advise, we decided to move. It was actually not that nice there. Sure, there was a strip of powdery white sand, lots of quiet surrounding but it was not as beautiful as it could have been. So we rented a scooter and explored the island. (it’s actually quite big so we didn’t see all but made it from up north down to infamous Had Rin, the party place, on the southern end). On our way we drove by the west coast and just out of curiosity walked down from the street to a beach and found our favourite spot. As we had already paid for the night at the other place, we decided to move this morning. But when we came here everything was already booked out. After asking around (and there are about four to five resorts here on this beach) we finally got a hut at Pimmada’s and are now staying on place that even has a pool, meaning it’s not the cheapest place but definitively still in our budget. I’ll leave the answer to the question why one would want a pool when a marvellous ocean is just two steps further away to someone else. We don’t know how long we’ll be staying but I guess, it’ll be our last island in the Gulf of Thailand. We most likely will skip Koh Samui (to big, touristy and expensive) and travel over to the other seaside of Thailand, the Andaman Sea, in a few days. 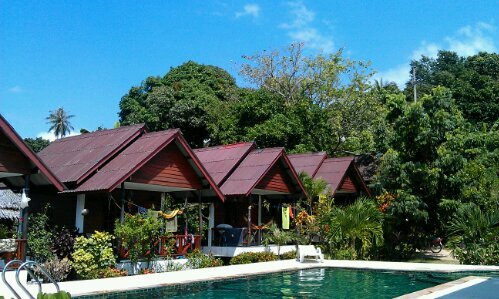 This entry was posted in Thailand and tagged Beach, Hostel, Koh Phangan, Summer by kathatravelling. Bookmark the permalink.